"I can do all things through Christ who strengthens me." Praying Hands Ranch was founded in 1987 in Parker, Colorado. We are located on the corner of Hilltop Road and Daley Circle. We are a 501(c)(3) Non-Sectarian Christian Organization committed to meeting the needs of handicapped children, adults, troubled youth and disabled veterans in a therapeutic ranch environment. Praying Hands Ranch offers Hippotherapy, Equine Programs, and Horticultural Experiences to clients. We serve 80+ special needs children and adults each week at our Therapeutic Riding Center. Volunteers and donations are always greatly appreciated. Volunteer seminar dates are on the Programs page. 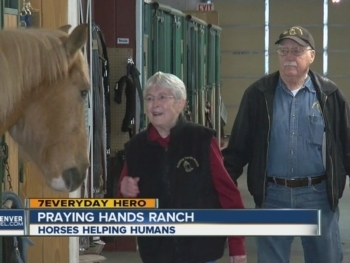 Praying Hands Ranch uses many volunteers in our programs. Please see How To Help for more information or call 303-841-4043. Part-time PATH International Certified Riding Instructors. Must be able to work on Saturdays. Join our team in helping others!